Martial arts is not only a fun and engaging activity, it is also a great way to cross-train if you are a professional athlete. Some of the world’s most talented sportsmen and sportswomen have turned to martial arts to improve their physical ability, whether it is to enhance their golf swing, increase the efficiency of shots they take from the field, or to help them ride the waves more intensely. Martial arts is the perfect cross-training activity because it increases an athlete’s flexibility, durability, and endurance while developing the entire body’s large and small muscle groups. There is a myriad of professionals who have turned to martial arts during the off-season, some of them you wouldn’t know just by looking. But don’t judge a person based on looks alone. There are so many athletes out there who have discovered the benefits of training in martial arts. Here are a few. Today, Evolve Daily shares 6 Sports Superstars Who Cross-Train In Martial Arts. Multiple-time NBA champion and former Los Angeles Lakers Center Shaquille O’Neal is a beast of a man with gigantic size and incredible strength. The basketball legend, however, has been a longtime fan of mixed martial arts and combat sports in general, training in multiple fighting disciplines, one of which is boxing. It’s amazing that a man that big can move with such grace and fluidity. Just goes to show that martial arts is pretty much for everyone: young or old, rich or poor, small or big. In 2009, Shaq even took on boxing great “The Golden Boy” Oscar De La Hoya in a highly-publicized four-round exhibition bout. Shaq trained with legendary coach Freddie Roach and even called himself “Manny Shaq-uiao” during the build-up. The much smaller yet way more skillful De La Hoya won of course, but not before producing a bout filled with laughs and crowd-pleasing sequences. One of the most dominant forwards in the NBA today, Carmelo Anthony of the Oklahoma City Thunder isn’t just a tremendous basketball player and consistent post threat, he’s also an excellent athlete who likes to cross-train in martial arts. Anthony is a big-time boxing fan, and in his downtime during summer breaks, he likes to hit the boxing gym and work on his combinations. “As athletes, and as basketball players, you have to find different things that can help you on the basketball court. For me, that’s boxing. When I’m in the gym, it’s me versus you and I don’t want to leave that gym with a loss. So that goes into my mindset, and it puts me in that tenacious focus on the basketball court that you just don’t want to lose,” said Anthony. High-level athletes in various sports cross-training in other sports is not something new. In fact, most athletes like to play different kinds of sports during their offseason, like basketball, or even snowboarding. NFL star and famed Green Bay Packers linebacker Clay Matthews has taken his cross-training to the next level by working out with none other than UFC legend Randy Couture. Couture has taken Matthews through the rounds in mixed martial arts. Jay Glazer, co-head of Couture’s MMA program for professional athletes, says that Matthews has since improved his strength and speed immensely, which has no doubt helped with his football game. More importantly, Glazer says it pushed Matthews’ breaking point way beyond the limits he thought he had. American professional surfer and model Alana Blanchard, surfs on the ASP World Tour and poses for Rip Curl swimwear, but did you know she was an advocate of martial arts? Blanchard loves to keep in shape through physical activity, and while she is already a world-class surfer, she is also a practitioner of Brazilian Jiu-Jitsu. When she isn’t hitting the lineup at some of the world’s most beautiful surf spots, Blanchard loves to take to that mat for a good roll. Aside from BJJ, she also practices yoga in her free time. If only she could use BJJ to grapple with sharks, then the ocean would be a lot safer for surfers around the world. Who would have known that this professional golfer is actually a practicing martial artist? The 46-year-old Mickelson has won five major PGA championships over the course of his career. But it isn’t just practice out on the course that has led to his success. Mickelson credits martial arts as having helped tremendously with his balance, flexibility, and core strength. 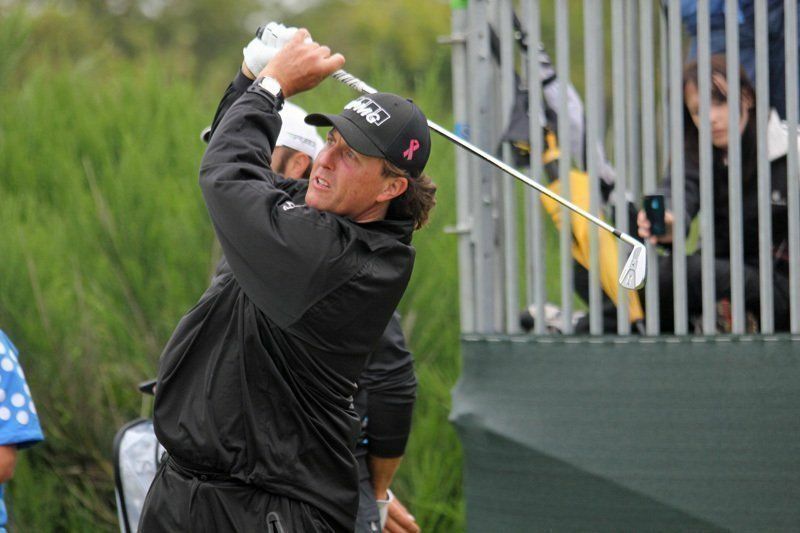 Mickelson is trained in both Kung Fu and Taekwondo, and it has undoubtedly affected his golf swing. According to his wife, however, the greatest thing about martial arts is that Mickelson has been able to slim down considerably and lose his famous beer belly.